3x5' Lions and Castles flag. This nylon flag is digitally dyed for excellent outdoor performance and durability. The flag comes with the standard canvas header and brass grommets and feature four rows of lock stitching on the fly end. Try a historical flag from All Star Flags. The Lions and Castles Flag (Castile and León) was one of the two flags that Christopher Columbus sailed under according to his log books in 1492. 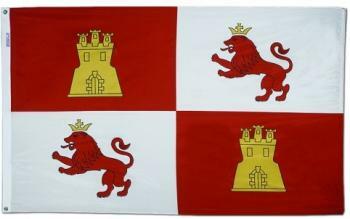 The Lions and Castles Flag featured the common Spanish symbols of the Castle on a red background and the Lion on a white background. The other was the Columbus flag with the F & Y letters centered by a green cross.